“FPSO” stands for Floating Production, Storage and Offloading. An FPSO system is an offshore production facility that is typically ship-shaped and stores crude oil in tanks located in the hull of the vessel. The crude oil is periodically offloaded to shuttle tankers or ocean-going barges for transport to shore. FPSO’s may be used as production facilities to develop marginal oil fields or fields in deepwater areas remote from the existing OCS pipeline infrastructure. Where have FPSO’s operated to date? FPSO’s have been used to develop offshore fields around the world since the late 1970’s.They have been used predominately in the North Sea, Brazil, Southeast Asian/South China Seas, the Mediterranean Sea, Australia, and off the West Coast of Africa. There are currently 70 FPSO’s in operation or under construction worldwide. In addition to FPSO’s, there have been a number of ship-shaped Floating Storage and Offloading (FSO) systems (vessels with no production processing equipment) used in these same areas to support oil and gas developments.One FSO is currently operated by PEMEX in the southern Gulf of Mexico (Bay of Campeche). Have there ever been any major spills from FPSO’s? Several organizations have developed comprehensive databases for all offshore incidents.A study by INTEC Engineering was commissioned by DeepStar early in the environmental impact statement (EIS) process to identify the spill history for FPSO operations. DeepStar is a multiphase deepwater technology study currently funded by 16 oil companies and more than 40 contributing manufacturers, vendors, consulting organizations, classification organizations, and contractors. The largest spill from an FPSO occurred in the late 1990’s – approximately 3,900 barrels of oil were spilled from the Texaco Captain FPSO during startup at its field location. The spill was attributed to human error during the start-up procedure; an overboard dump valve wasinadvertently left open and hydrocarbons were released. Oil spills from all other FPSO operations have reportedly spilled less than 500 barrels of oil combined. FPSO’s have been successfully operating for a cumulative 460 plus FPSO-years, processing an estimated 6.4 billion barrels of crude oil. Why did MMS require an EIS? initiated not only to evaluate potential environmental impacts, but also to provide for public disclosure and input. For the purposes of the EIS, how is deepwater defined? The MMS chose the 200-meter (approximately 650-foot) isobath to represent the beginning of deepwater area for the purposes of this EIS. The MMS recognizes that deepwater is defined differently by many operators. However, in considering the water depths that FPSO's have operated in the past, we believe 650 feet is a reasonable definition for deepwater. Why did you investigate FPSO’s only for the Central and Western Planning Areas? As industry is proposing the use of FPSO in the Gulf of Mexico OCS (the proponent of the proposed action), MMS relied on industry to identify the scope of their proposed activities.Industry indicated an interest in FPSO operations for only the deepwater areas of the Central and Western Planning Areas of the Gulf of Mexico OCS. In addition, industry indicated they did not anticipate that produced oil from any FPSO would be tankered into any ports east of the Mississippi River ports. What was the FPSO system studied in the EIS, and how was it chosen? - conventional, ship-shaped, shuttle tankers with 500,000 barrel storage capabilities. The base case investigated in the EIS addressed shuttle tankers. Why did you not consider tugbarge systems (e.g., articulated tug and barge (ATB)? The use of a conventional shuttle tanker was identified by the industry/MMS/USCG team as the most likely scenario for an FPSO-based development in the GOM. The EIS does not exclude the use of ATB’s; both shuttle tankers and ATB’s would transport the oil from the FPSO to shore. The EIS addressed the potential use of ATB’s as part of the range of technical options for the proposed action. In responding to comments on the draft EIS, the USCG stated that they consider an ATB to be a specialized type of integrated tug barge (ITB) and subject to policies described in the USCG Navigation and Vessel Inspection Circular (NVIC) 2-81 (Change 1). 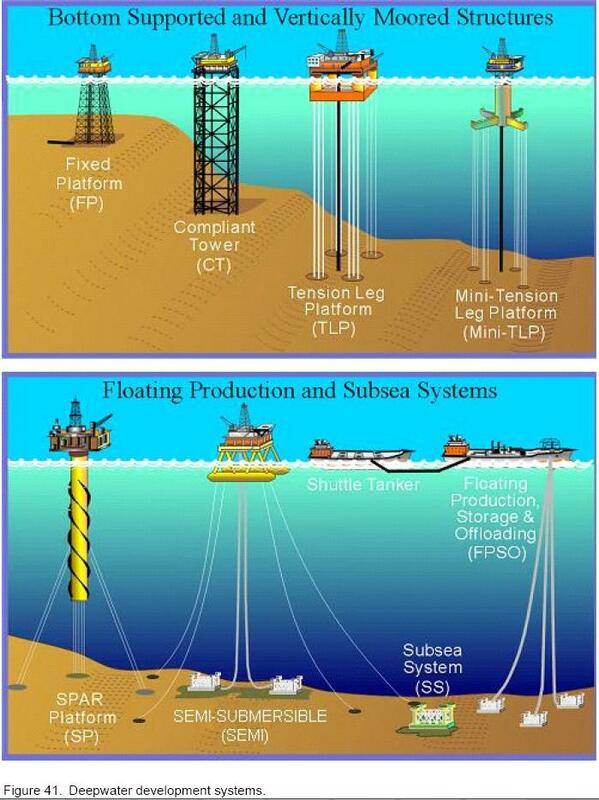 The use of ATB’s is an issue that the USCG would address in their permit requirements for the FPSO-based development. Why didn't the EIS address floating storage units? A Floating Storage and Offloading (FSO) unit can be considered to be a subset of FPSO’s.The FSO system lacks the oil and gas production processing capabilities of the FPSO. An FSO is typically used as a storage unit for production processed from other platforms that are remote from infrastructure and lack an oil pipeline to transport the oil to the refinery. Oneexample is the Ta’Kuntah FSO that has been operating in the southern GOM (Mexican waters)since 1999. The EIS provides a programmatic NEPA review of the major aspects of FPSO’s and FPSO-like operations, including on-site storage of large volumes of produced oil, offloading operations, surface transport of OCS-produced crude oil, and the potential fate and effects of very large oil spills. The environmental review of an FSO proposal would be able to tier fromthe EIS and incorporate by reference the analyses of the aspects in common. What is the next step now that MMS has issued the Final EIS and a Record of Decision (ROD)? The ROD documents the Agency’s decisions that are based on the EIS and is the formal completion of the EIS process. The MMS will continue to work with the U.S. Coast Guard (USCG) to delineate jurisdictional issues based on the Memorandum of Understanding between the two agencies. That Memorandum of Understanding was signed in December 1999 and addresses all OCS oil and gas activities. Discussions with USCG will continue about the potential use of FPSO’s within portions of the lightering prohibited areas. There will be continued dialogue and work group activities with the industry to further enhance existing recommended practices, guidelines and standards for floating production systems (including FPSO's). The API has also commissioned a workgroup to further address concerns associatedwith shuttling crude oil from OCS production facilities to the tanker operations in the GOM.Both MMS and the USCG are involved in the API-led effort. Further action on any specific FPSO proposal would proceed as with any other hydrocarbon development in deepwater. The first formal step in the proposal process would be the submission, review, and approval of a Deepwater Operations Plan. Later, the operator would submit an OCS development plan. At that time, an environmental assessment would be done to evaluate the site-specific and proposal-specific aspects of the proposed FPSO operations. 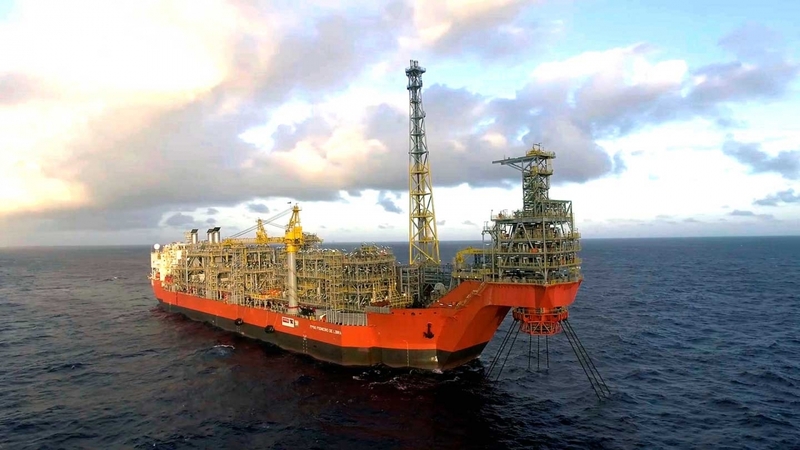 What level of review will be required if a proposal is submitted for FPSO operations that aren’t like the EIS base case (e.g., a single-hulled FPSO)? The EIS is a programmatic document that examines the concept of, and fundamental issues associated with, the petroleum industry’s proposed use of FPSO’s in the Central and Western Planning Areas of the Gulf OCS. The EIS addresses the proposed action generically and does not constitute a review of any site-specific development proposal. The EIS considers a range of technical variations that would reasonably be expected to represent industry’s intended applications of these systems. The major components of the “base-case,” a generic FPSO system and operation, generally fall within a range of potentially viable design choices andconfigurations. The EIS provides a programmatic NEPA review of the major aspects of FPSO’s and FPSO-like operations, including on site-storage of large volumes of produced oil, offloadingoperations, surface transport of OCS-produced crude oil, and the potential fate and effect of very large accidental oil spills. Further technical and environmental evaluation will be required for specific FPSO proposals. The MMS will require submission and approval of a DeepwaterOperations Plan (DWOP) and a Development Operations and Coordination Document (DOCD) before any FPSO operation could occur. The DOCD environmental review will the regional environmental analysis in the programmatic EIS and will focus on the site-specific and system-specific aspects of the proposed FPSO. Any proposed FPSO operations that are not within the range of operations evaluated in the programmatic EIS will require more extensive environmental review and NEPA documentation than would proposed operations within the range addressed in the EIS. What has been accomplished as a result of the EIS? The regulatory model process? The EIS examined the range of most likely configurations of potential FPSO operations that may be proposed for use in the Gulf of Mexico OCS. The EIS provides a programmatic NEPA review of the major aspects of FPSO’s and FPSO-like operations, including on-site storage of large volumes of produced oil, offloading operations, surface transport of OCSproduced crude oil, and the potential fate and effects of very large oil spills. Although the level of environmental review for a site-specific, proposal-specific development plan will be the final decision document in the Record of Decision (ROD) and on the specific operations proposed, the EIS was intended to serve as a base document from which to tier subsequentenvironmental review of FPSO’s. This should allow FPSO proposals within the range of operations addressed in the EIS and conforming to any constraints imposed by the ROD to be addressed by a site- and proposal-specific environmental assessment (EA). The MMS anticipates that such an EA would be completed within six months. Review of the Regulatory Model has resulted in an MMS-proposed regulatory package to enhance the existing rules through the incorporation of several recommended practices. A complete rewrite of the Platforms and Structures section (Subpart I) in 30 CFR 250 is one of the key parts of this regulatory package to address all floating production systems (including FPSO’s). Also part of this effort is the incorporation of several recommended practices into the existing pollution prevention regulations (30 CFR 250). Publication of the MMS regulatory package (Documents Incorporated by Reference and Subpart I rewrite) was published as a Draft Rule in December 2001. The Regulatory Model development has allowed the MMS and USCG to identify the applicable industry design and operating standards for FPSO-based developments that have beenapplied throughout the world. This effort has also identified where gaps exist in the design and operating standards, allowing the agencies and industry to develop appropriate strategies closing the gaps. When competed, the regulatory model will provide industry with a road map for the approval process of an FPSO-based development on the Gulf of Mexico OCS.During this time, the MMS funded a Comparative Risk Analysis to evaluate the risks associated with FPSO technology compared to those associated with three types of existing GOM deepwater facilities. The U.S. Fish and Wildlife Service and the National Marine Fisheries Service were consulted on FPSO-related issues under their respective jurisdictions.The MMS sponsored and participated in several joint Federal/industry workshops to identify the technical, safety, and environmental issues and information needs related to FPSO’s, as well as to gain a better understanding of FPSO technology and scope of operations around the world. What steps remain to be taken by government and industry to complete the regulatory model and what is the timetable? Coordination and settlement of overlapping responsibilities between the USCG and MMS are continuing. Both MMS and the USCG believe the capability (framework) exists to review an FPSO-based development. This effort has progressed to the point of determining the specific points within the production and marine systems where jurisdiction changes. The objectives of this effort are to minimize duplication of effort and to ensure a consistent regulatory review for FPSO-based developments. In addition, publication of a regulatory package by MMS (Documents Incorporated by Reference and Subpart I rewrite) will enhance MMS’s ability to regulate all floating production systems, including FPSO’s, in the Gulf of Mexico OCS. A work group comprising the Offshore Operators Committee, MMS, and USCG developed a set of recommended actions as part of a broad regulatory framework for FPSO’s in the GOM. There are several outstanding recommendations affecting industry and the USCG that need to be addressed. No specific timeline has been developed by the industry to close these action items; the USCG continues to gather information and is working closely with MMS to address mutual requirements. What was the focus for your Comparative Risk Analysis (CRA)? Concurrent with the EIS, the MMS-funded CRA was performed to compare the relative risks of an FPSO system with three other deepwater development systems: fixed platform production hub, a spar, and a tension leg platform (TLP). All of the production systems except the FPSO are currently in use for deepwater development projects in the U.S. Gulf of Mexico.The study was performed under contract to the Offshore Technology Research Center, with technical support from EQE International and the industry consortium DeepStar. The CRA used the same base-case FPSO system that was used in the EIS. The overall intent of the CRA was to provide MMS context and perspective for FPSO risks, and to assist with MMS decisions regarding the potential use of FPSO's in the Gulf OCS. The CRA was also designed to help MMS understand the risk contributions of the various components (subsystems) and phases of operation.